Vaccinating pigs against parasitic infections has not hitherto been a priority. However, with the increasing risks of zoonotic parasitic infection and these parasites affecting human health, there is now significant interest for developing new vaccines. Vaccinating against parasites in swine populations is rare. In fact, at present there are no commercially available vaccines for parasitic infections in pigs. This is mainly because the development of immunity is so slow for parasitic infections that there is not enough time before animals go to slaughter for the vaccine to be worthwhile. However, developing vaccines for use against parasites is still a significant area of research, in both medical and veterinary fields. Zoonotic parasites in particular attract the attention of those involved in the One Health movement, a collaboration across all scientific health- and environment-related disciplines, due to their ability to be transferred via the food-chain. In fact, the only anti-parasite vaccine currently in use in pigs – though not commercially available – is the anti-Cycticercus cellulosae-vaccine, to prevent porcine cycticercosis, which can lead to the tapeworm (Taenia solium) in humans. As parasites are not currently a major concern within swine production, a blanket approach to anti-parasitic treatment is often applied, not driven by an individual diagnosis. Drugs are usually given during the pre-patent phase, before parasites are easily detectable in routine screening, in an effort to prevent environmental transmission of the parasite. However, overuse of these drugs raises concerns about increased likelihood of resistance, and with no routine tests, parasiticide resistance goes under-reported. This method of treating infection has also seen a rise in drug residues detected in meat, which may get into the food chain. Unfortunately, due to the high prevalence and the ability for the eggs to survive for a long time outside the host, fully eliminating the infection from a herd is very difficult. For example, Ascaris suum (large roundworm) eggs are incredibly durable and can survive in the soil for years under the right conditions. Other practices like chemical disinfection and all-in-all-out production (the system of grouping similar aged pigs together for the entire production process, breaking the chain of infection and preventing disease spread) can help reduce the spread of parasitic infections but are unlikely to be able to eliminate it. What are the best candidates for vaccines? There are a number of key criteria to look for when developing a vaccine for livestock. Firstly, they must pose a significant risk of economic loss and/or serious disease. The natural infections must also be able to trigger protective immunity and immunological memory. As previously mentioned, zoonotic parasites, like the protozoa Toxoplasma gondii, make attractive candidates for vaccine development. 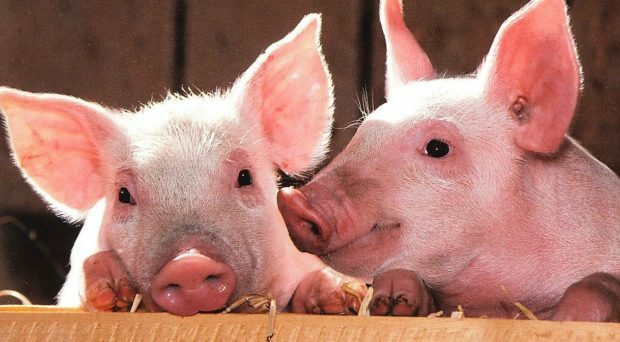 However, whilst vaccinating pigs against toxoplasma would prevent foodborne transmission to humans, it causes few problems in swine and only minor production losses. The best candidate highlighted in the recent review in Porcine Health Management, could be Cystoisospora suis, a parasitic protist apicomplexan alveolate (just as Toxoplasma), which causes severe neonatal diarrhoea in 2 week old piglets. C. suis spreads quickly through a litter, as infected pigs excrete millions of oocysts during the patent phase of infection, which can cause diarrhoea for up to 6 days. Even after the infection has passed, animals will be poorly developed and much smaller than their healthy counterparts, and there is an increased chance of morbidity, contributing to the financial losses from infection. can not only cause the associated symptoms like neonatal diarrhoea, but it can damage the development of the gut microbiota, increasing risk of bacterial infection and affecting intestinal and immune functions long-term. However, a 2014 study found that by inoculating the pregnant sow before birth with high doses of C. suis oocysts, the sow had no clinical signs of infection or oocyst excretion, and the levels of immunoglobulins in their blood and milk provided partial protection for the offspring as well. This would then help protect the piglets during the first few weeks, when their immune system is most vulnerable. In conclusion, C. suis could be a good candidate, but further research will need to be carried out on the mechanisms of immunological protection. Until recently the search for new vaccine candidates has been slow and expensive, but with new advances in technologies and high-throughput screening techniques, it has enabled fast and cost-effective genome screening of potential parasites for targeting.